I️ enjoy getting custom work and had the pleasure of working with some friends recently to create an heirloom wedding band for their future son-in-law. 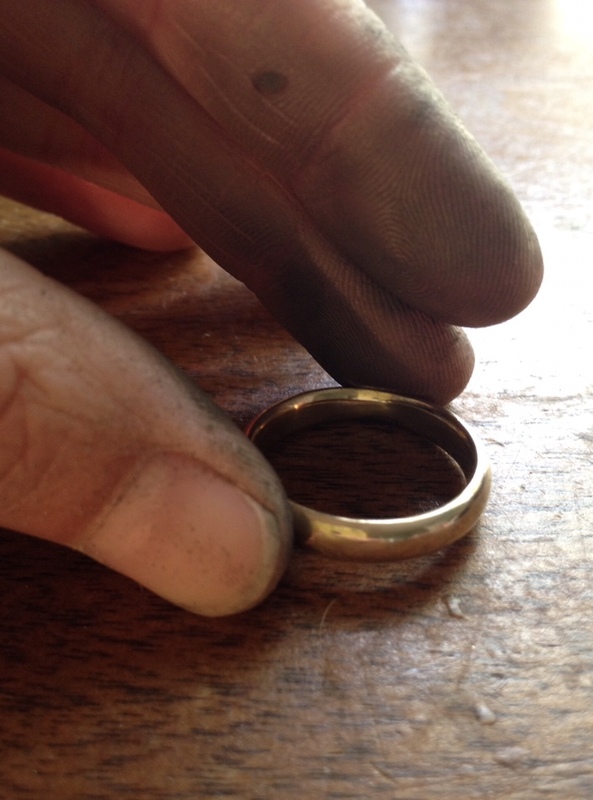 We started by melting down an old gold ring, which was poured into an ingot mold. Ingot mold seen on the left side. Here is the gold in ingot form. Next I️ begin to roll down the wire and form it into the ring shape. It looks rough now but it’s all part of the magic! 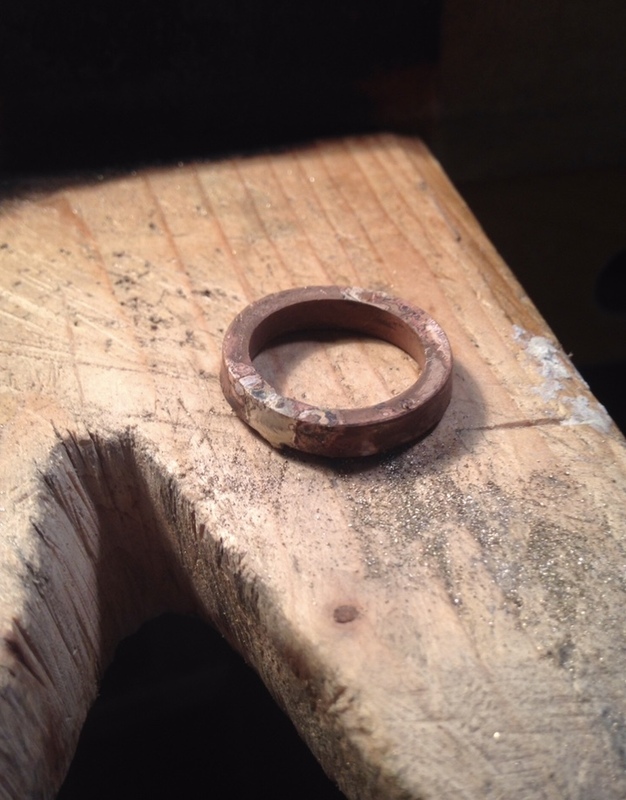 Now the ring is cut to size and soldered together. Last is to shape the ring and soften the edges so it fits more comfortably. The ring gets a nice high polish and is ready for the ceremony. I recently finished a custom project that was really fun and a bit off the beaten path for me. 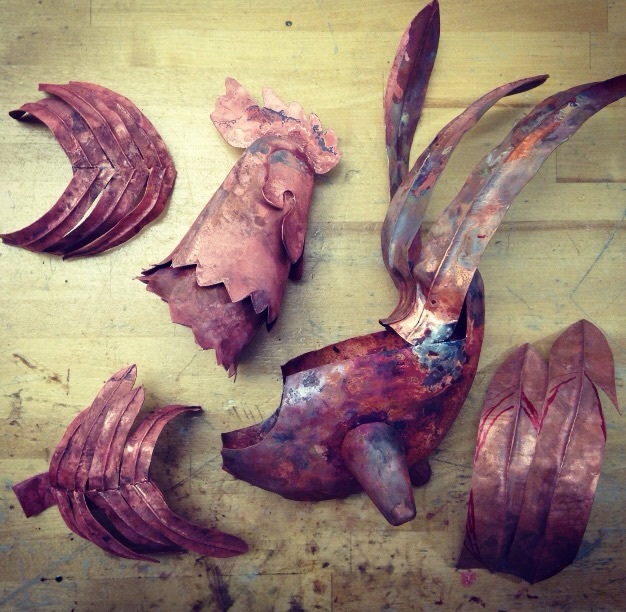 I was asked to make a copper rooster to bring good luck for Juniper, a local restaurant. I don't usually make sculptural pieces so it was really fun to problem solve and see the piece come together. You can see the project starts with sheet metal. 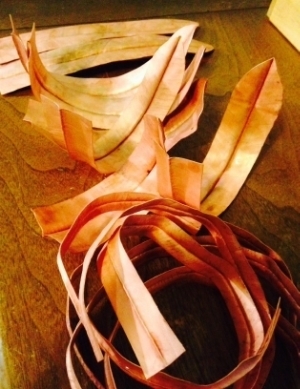 The pieces are cut into long strips and then form folded to create texture for the feathers. He's a hollow guy, so I had to do a little pattern making to figure out how all the parts would fit together. All in all, I'm pretty happy with how he turned out! He's about 12 inches tall, for scale reference. I've been working on new pieces over the past couple months, which are finally ready to be seen! Check out the shop over the next few days as I will be adding new work each day. Lots of great pendants and earrings that are easy to wear for that transition from work to a night out on the town. I hope you like silver! Just a few snapshots from around the studio. This is pretty much how it's set up all the time, just usually it's a lot dirtier! Some of my designs I carve in wax first, which is then cast into metal for the final design. I carve my own waxes by hand and enjoy the process of transformation between materials. Simple hand tools are used to finish my designs. A small needle file is used to clean up the surface on this silver link. This last photo shows the progression of making an earring. 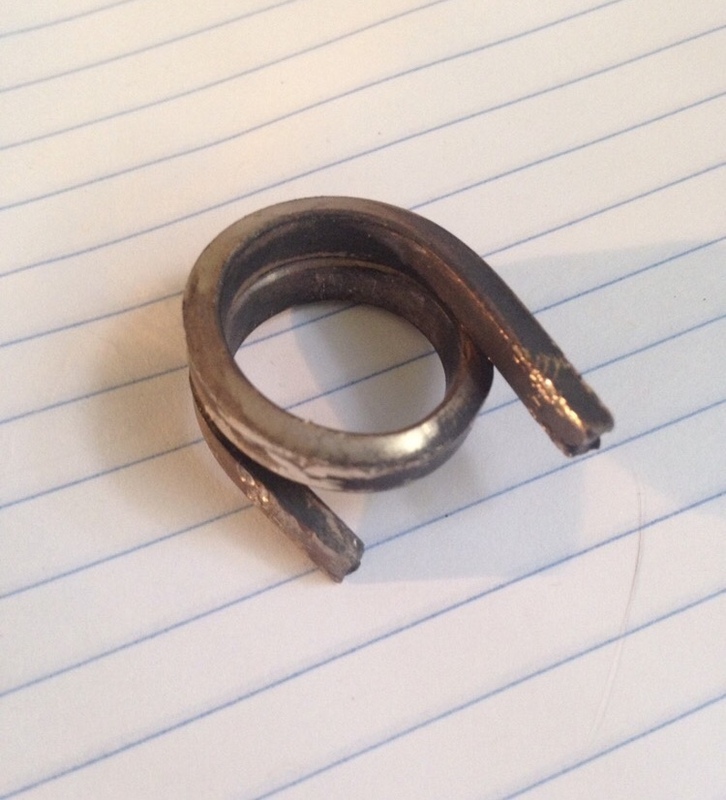 Here, the setting are soldered together, with an ear wire attached. Next, the stones get set by hand. Last, the ear wire is formed into shape and the earring is ready to wear. These are lapis lazuli stones set in sterling silver. I finally made my way to Tucson to check out some gems & hang with some very near & dear ladies. It was great to drive west to the desert & get out of town. If you've not been to the Gem & Mineral Show, it's amazing and overwhelming! Plus time spent exploring town, catching up with old buds & being shown around by locals helps too. Mucho thanks to Jim & Co. at Chez's Lounge each night, inquisitive discussions from Ben; loved shopping Mary's vintage finds & getting try on Veleta's amazing natural mineral nail polish- Mine Luxury Nail Laquer. 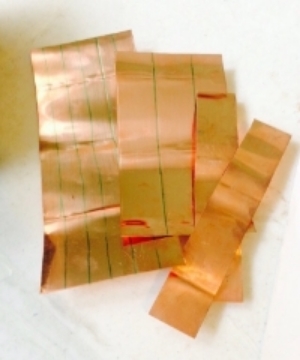 Also, got lots of new materials to work with! Feeling refreshed & inspired. Making some new snake earrings. Here's a finished pair, with post backs, slithering with some that are half finished. I've been working on some really cool, unique rings for my friends who got married this weekend. Congrats Dane & Daryl!! Here's a few process shots of making Dane's hefty ring. 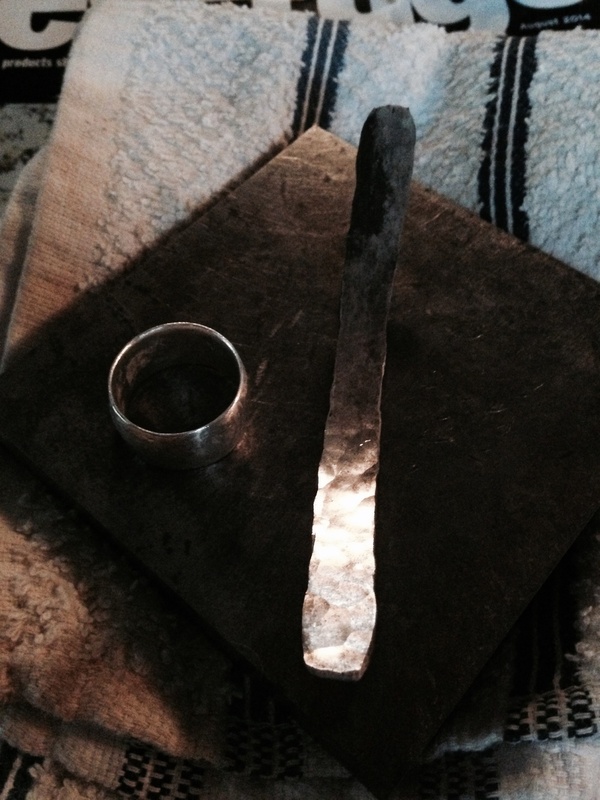 Here I melted down the silver into a large ingot. It's still glowing! Some rolling down and forging to make the band the right thickness. Here's all the finished rings. Danes got a beautiful gold bear paw on his. Daryl with her Arkansas diamond engagement band and wedding bands. Congrats you two! Perusing some jewelry making videos today, love seeing how things are done industrial- so different than working with my hands. Last weekend was my first Blue Dome Festival! I had a wonderful time connecting with old & new friends. 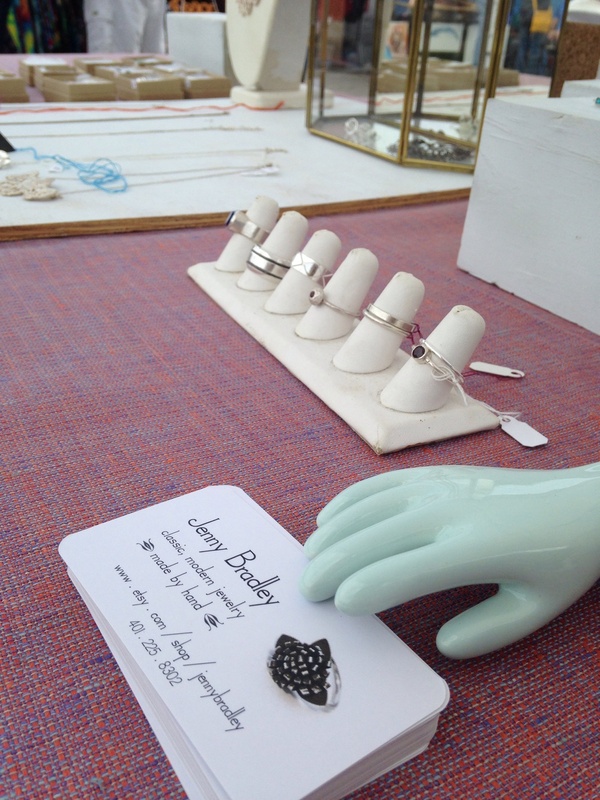 The weekend couldn't have been more beautiful and it was full festival mode- lots of food trucks, art & music. Thanks to my friends & family who helped me with the booth! I really had a lovely time.